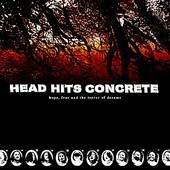 In Music We Trust - Head Hits Concrete: Hope, Fear, and the Terror of Dreams 7"
Excuse me while I peel myself off the wall? Woa. This is great. HEAD HITS CONCRETE is a jacked up and hyper-blasting outfit who take a DEP inspired neo-grind sound and crank it to eleven. A literal saturation bombing of sound spews off of this 7". It's violent, political, and irate. It reminds these over-abused ears of a mix of the ferocity of RED CHORD, the immediacy of TOSHIRO MIFUNE and the blast-a-millisecond mania of PARADE OF THE LIFELESS. And, yes, it is as good as the comparisons imply. Hailing from Canada, it seems to me that HHC are on a mission to melt the frozen tundra of their native land.